Eliminate piles of burned CDs & slow load times. Whether you're a seasoned IT Pro or just tech support for friends & family, isostick can make your life easier (though you'll need a new source of coasters). 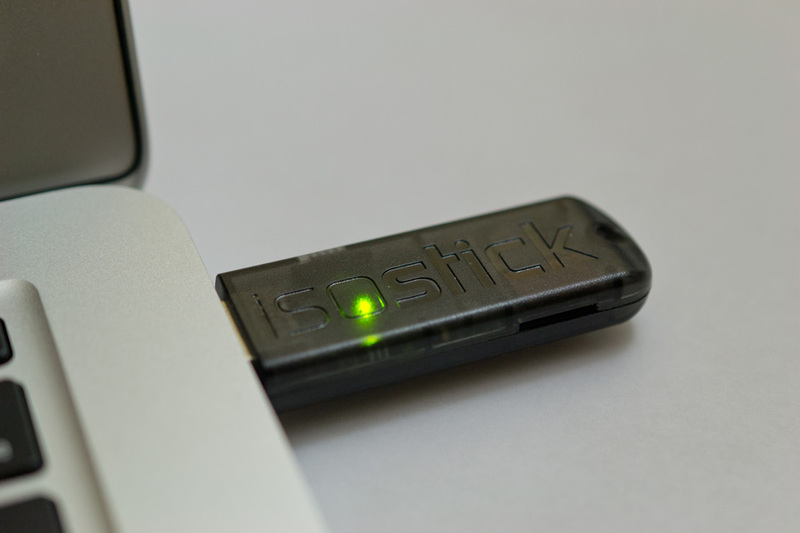 The isostick shows up as two drives: an optical drive and a flash drive. It lets you "load" ISOs from the flash drive into the optical drive—sort of like mounting a disc image in *nix, or using DAEMON Tools in Windows—except computers think it's a real, physical optical drive, with no software required. 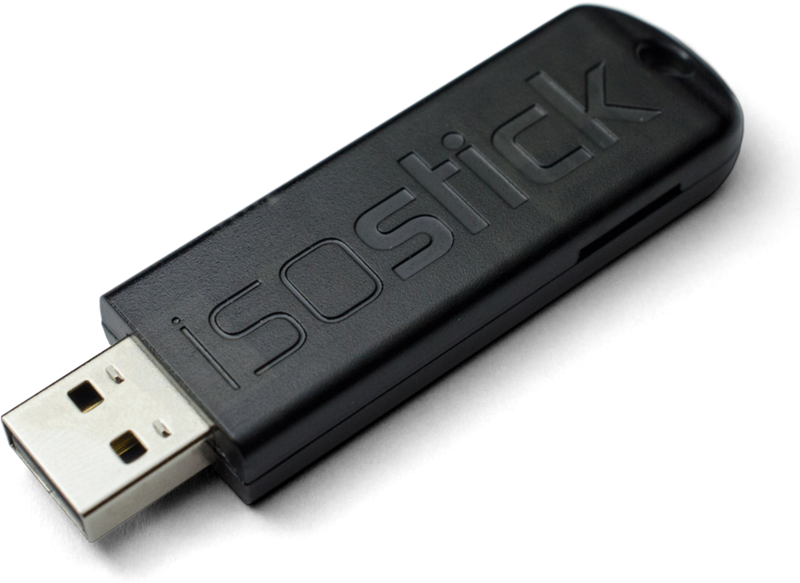 Because it's all in hardware, you're able to boot from isostick directly. 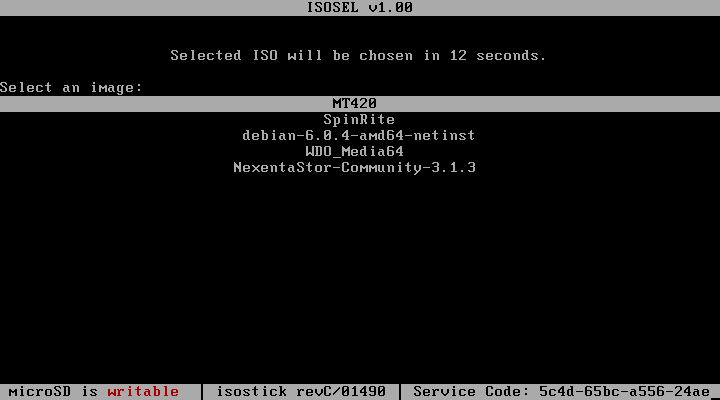 If you can boot from a USB CDROM, then you can boot from isostick. Oh, and you can store anything on your isostick—not just ISOs! Intrigued? Scroll down or check out the FAQ for more info! Note that isosel does not work on some newer UEFI machines. See the FAQ for more info. Also check out the Tested Hardware page. Designed to fit on your keychain, isostick travels with you. Now your disc images will follow you anywhere you go, no more lugging around that pile of CDs "just in case." You never know what may be on a client's machine. Fortunately, isostick has you covered with its hardware read-only switch. Malware simply cannot bypass it. Bug fixes and new features are released at no cost. Additionally, if we ever stop supporting isostick we'll release everything under the MIT license. That way even if we stop development, the community can take over. With throughput of 82x CD (9x DVD) and almost no seek time, you won't be waiting around. Note: Actual throughput depends on the microSD card used. We stand by our work with a 30-day happiness guarantee—if you're not satisfied within 30 days of purchase we will exchange or refund your order, no questions asked. 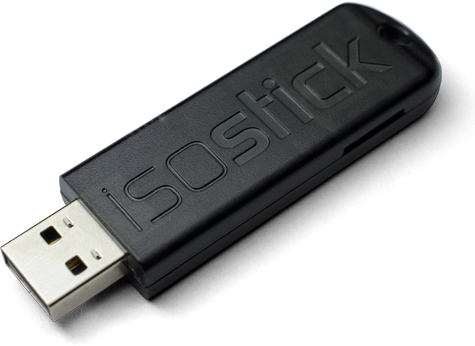 isostick supports split ISO files, so the 4GB limit of FAT32 isn't an issue. Only lead-free and RoHS-compliant parts are used in the manufacture of isosticks. Oh, and it's asbestos-free. Take a look at the reviews on Amazon. It's not just about less hassle—fewer burned CDs means less waste. As part of our commitment to the environment, we use recyclable cardboard packaging rather than plastic. All documentation is online, so you'll always have the latest information right at your fingertips. Designed, manufactured, and tested in the United States. 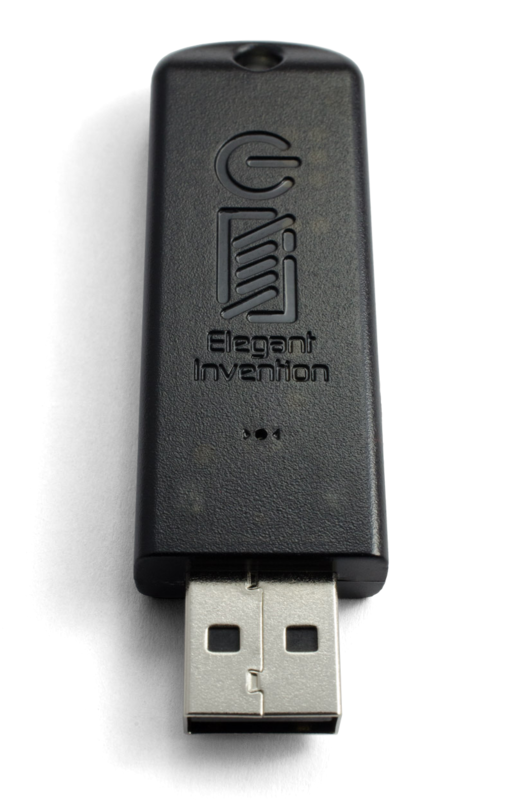 Founded in 2009, Elegant Invention is a small technology company located in South Bend, IN, USA. Our passion is building affordable hardware and software solutions to make your life easier! I love isostick! I throw my stick in my pocket, and I head to all my off-site locations with the peace of mind that I have all my tools where I need them. It’s an invaluable part of my kit!